Kathryn Minshew, 29, is the founder and CEO of TheMuse. com, a career platform and discovery tool serving over 3 million professionals worldwide. Previously, she worked on vaccine introduction in Africa with the Clinton Health Access Initiative. A graduate of Duke University with a B.A. in Political Science, as well as a second in International Relations earned at the Institut d’Etudes politiques de Stradbourg, Minshew has appeared in Forbes, Inc., and contributes on entrepreneurship and career advice to the Wall Street Journal and the Harvard Business Review. How did the idea for TheMuse.com originate? I was looking for a new job, and felt that most existing job sites were just awful, clunky, archaic lists of irrelevant positions. It was like death by 1,000 rectangles. I thought someone should be able to build a better site, a place where people could enjoy browsing different career paths and imagining themselves in different roles. I wanted to build something that would last— something that people could trust. Tell us about the transition from political science major to tech entrepreneur? In some ways I was lucky, because going into tech, I didn’t know what I didn’t know. I had no idea how hard parts of the transition would be, but sometimes that’s helpful when you’re just starting out. I had studied computer science in high school, but gave it up as I got into other subjects. This life has been a fun way to get back into working in technology 24/7. Can you share any best moments of your workday? The best moments are when we get raving feedback from a user, or a thank you note from someone whose life has been changed through The Muse; those are really incredible. I also love when we close a new customer, and the days where I can tangibly feel the progress we are making as a company. My days are incredibly varied. When I’m in New York, I’m usually up around 8:30 a.m., having worked into the wee hours the night before. I’ll get to the office around 9:30 a.m. after spending some time on email at home. I may take a few meetings in the morning, followed by more time on email, and then maybe an internal team meeting and more calls/emails in the afternoon. I might leave the office around 8 p.m. to go meet a business contact or a friend for dinner, but then I usually spend several more hours on email at home before I go to bed. I don’t mind though— I guess that’s the nice part of loving what you do. What does an ideal day off look like? Traveling! I’m an absolute junkie for international travel, especially to slightly unusual locations. When I get an off day here in New York, I’ll often take the subway to a new part of town to explore, or meet up with friends for some good food. I can also be very happy with a comfy chair and some delicious coffee. Any thoughts, opinions or advice for young women interested in a career in technology or entrepreneurship? It’s not always an easy career, but it’s phenomenally rewarding. My advice would be, firstly, to take a coding class if you have the option to do so—it’s good to be at least code literate, and you might be surprised how much you enjoy it. Secondly, as you go through life, keep an eye out for interesting problems to solve; things you think could you improve. This sort of thinking will eventually help you notice opportunities to start a business or improve a process with technology. And finally, cultivate empathy. The best products and companies are highly empathetic to the needs of their user base, and I believe empathy is one of the most critical but underrated skills in the tech industry. There are so many. Cathie Black, of Hearst, from whom I’ve learned so much about leadership. Sallie Krawcheck, in finance, who now runs a women’s network, Elevate. Anjula AchariaBath, entrepreneur, digital powerhouse and angel investor. And Rachel Sklar, one of the first women I met in technology, who has spent most of her career advocating for a more diverse tech industry and has, through a lot of courage, affected some incredible change. I’ve been incredibly lucky to have the support of some unbelievably talented women (and men) as my cofounder Alex and I have built The Muse. Snacks! My team calls me Snacky Muse sometimes because of my love for snacks (and snacking!) all the time. Nuts, chips, fruit, salami… generally if someone is feeding me, I’m very happy. Evelyn Rusli has a story to tell. Before the age of 30, Rusli achieved career heights reporters often dream of yet rarely reach. Her hard work and tenacious nature secured her positions at the nation’s most coveted news institutions: the New York Times, Forbes.com, and the Wall Street Journal. She is a Princeton graduate with a resume that spans from the 2004 tsunami disaster in Indonesia, to video anchoring for TechCrunch, to her current role covering all things technology in the San Francisco Bay area. How did you make the transition from English major to Journalism? As a freshman in college, I was contemplating a career in either environmental law or journalism. In a bid to figure out my path, I decided to pursue a journalism internship my freshman summer. One thing I really wanted to avoid: nabbing an internship at a prestigious publication only to fetch coffee. I settled on the San Francisco Examiner, a once prominent paper that was struggling with a very small news staff. I immediately sent an email to one of the editors explaining that I was a college freshman student and that I would be in the San Francisco area in a couple of months. And oh yeah, I was willing to work for free. They were so short-staffed I was able to nab more than a dozen frontpage pieces that summer. Eventually, I parlayed those bylines to an internship and freelance gig with the New York Times in Indonesia the next summer, and spent every college winter and summer thereafter working for the Times. What was the moment you decided to cover specifically technology? It was Google’s bash at the World Economic Forum in 2010. I was there covering the event for Forbes. There were Google executives hanging by the bar slinging back novelty cocktails, media mogul Arianna Huffington holding court at the center, and a funny mix of business and tech bigwigs taking hits at the oxygen bar, including Ev Williams, the co-founder of Twitter. Only months earlier Mr. Williams had received a call from the U.S. State Department asking him to delay maintenance of his site because it had become such a critical communications tool for protesters in Iran. A few weeks later, I quit my job at Forbes. I didn’t know all the names in the room, but I was acutely aware on that evening that this was becoming the new seat of power in the economy and everything was about to bend towards it. Biggest revelation since you began covering tech? How interconnected this industry is. Almost nothing exists in a vacuum. I considered Silicon Valley to be a curious collection of incredible individuals, a kind of beacon for outliers. And it is that. But there is also the strange machinery underneath Silicon Valley that gives life to new companies and leads to out-sized outcomes. This industry functions like a large high school; there are tight cliques, allegiances, queen bees, and the connectors that tie together the different clusters. It is far more interconnected, far more cliquish, than one could possibly imagine. In the game of tech and venture capital, there is always a great deal of luck, but that luck often flows through structures and alliances that have been forming for years, if not decades. That is not to say that the system is static. The power structures can be volatile, constantly pitching and collapsing, growing and shrinking, but there is a system. Any thoughts, opinions or advice for women interested in a career in journalism or technology? This advice applies to women and men. Don’t follow the traditional or expected paths to success, particularly in journalism. Determine your goal and then try to find creative routes—ways to add value that will help you stand out from the pack. Wherever the crowd is, you probably want to be somewhere else. Don’t be afraid of doing something unorthodox. If I went through the traditional routes, I wouldn’t have, essentially, created an intern position at the San Francisco Examiner or worked for the New York Times Southeast Asian bureau, which, once again, didn’t have a formal internship program. But I was scrappy, persistent and pretty much pleaded—some would say barged—my way through and then, once I was there, took every opportunity to learn and prove my worth. Today, thanks to social media and the boom in new media outlets, there are even more ways to be unorthodox and find a way to stand out. Within the tech industry, there has been a lot of talk lately about the dearth of women in tech—which is definitely true—but I find myself constantly meeting kickass, high-achieving women. Often, some of the most skilled, brightest women in tech are the least exposed, the least likely to chase press—they’re too busy actually getting stuff done—which I respect. Above all, Jane Perlez, my mentor from the New York Times (she still works for the Times in Beijing). She’s had one of the most illustrious careers in journalism, covering some of the defining conflicts of the last three decades, including the unrest in Pakistan and Afghanistan, which earned her a Pulitzer in 2009. 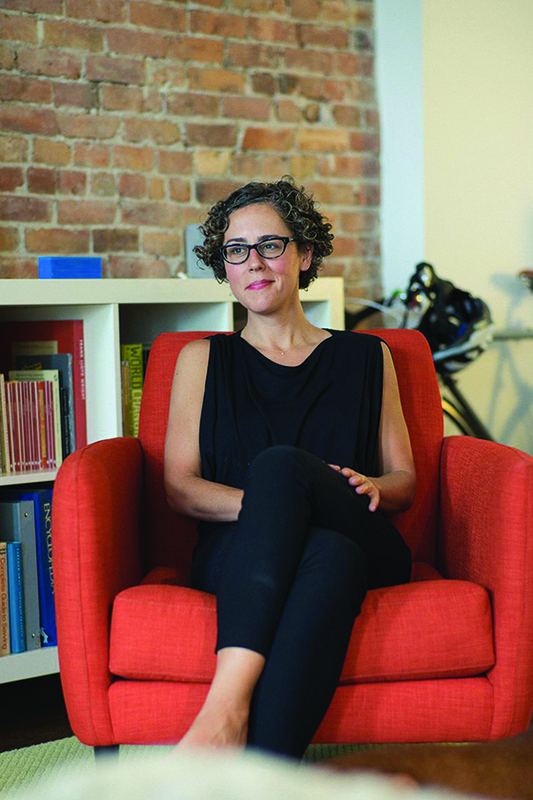 Liz Danzico has built a career from curiosity, passion and multitasking. She is the creator and chair of MFA Interaction Design at the School of Visual Arts. Last year, she was offered the role of Creative Director at NPR. Splitting her time between New York and D.C., Danzico heads the visual and user experience on all NPR-branded digital platforms. You have an interesting career in Interactive Design. How would you describe what you do and how it came about? All the good decisions I’ve made have come about by trusting uncertainty. What I mean is that I try to narrow down on things I’m wildly curious about, but not certain I’m completely qualified for. Somewhere in that intersection, I always find a new pathway. Can you give us an example of a new pathway emerging? When I found myself in the closet of the basement of the building I worked in for my day job for the magazine [Box & Arrows] I was the editor for. It was a really key interview with a really great author. The closet didn’t have lights in it. I did an hour-long phone conversation in the dark with the broom and the mop and the soapy water. It dawned on me in the closet: I need to quit this job and work on my own. Let me make a go of all these projects I have on the go. So I started a studio. I did that until the SVA called me to create the graduate program. Tell us about creating the MFA program at the School of Visual Arts. It brought together all the things I had been doing—product development, designing experiences—it’s all about thinking about audience. I had been teaching since I graduated college [at Carnegie Mellon University]. It never occurred to me to make it a fulltime position until I was offered the opportunity to create a program at the School of Visual Arts. If anyone had told me how much impact or how much work it would be I never would have taken it. I don’t think I had any idea how much influence that kind of experience could have on someone’s life. I would have been absolutely terrified. But it has been one of the most rewarding things I have ever done. I never thought I would stay for more than two or three years, and I have been there for eight years. How did the NPR position arise? The NPR job offer happened like all things happen, which is through people you know and things you have done. Which is not something that anyone ever told me back when I started. So I’m glad to help the students who graduate the program. What are some of the changes you have made in your role as NPR’s Creative Director over the past year? We’ve hired a terrific design team and, more recently, appointed a Deputy Creative Director to work more closely with the team. With both of those changes, our capacity to support NPR and its storytelling has increased and expanded. There is always a good mix of NPR and SVA among other professional/personal side projects. Because of a rather packed schedule, I’m firm believer in doing at least one thing for yourself every day. If you do one thing for yourself, not matter how hectic your day gets, no matter how many meetings you must attend, or what gets out of your control, at least you did one thing for yourself. So a typical day for me involves at least one of the things I love to do: running, cooking, playing music, or spending time with people I love. Doing something unexpected. I just returned from a week-long vacation of unexpected everydays. Any thoughts, opinions or advice for young women interested in a career in technology or interactive design? Try everything. Learn how to be open to everything, how to try out everything, prototype things, test things, experiment with things. Then learn how to close doors. Learn how to make decisions about what you like and don’t like. Learn how to decide what is interesting to you so you can begin to focus and work in that direction. Not to have a plan per se, but to work toward a general direction you’re wildly passionate about curious about. Do that, and the pieces fall into place. Jane Jacobs, Lily Tomlin, Florence (Shu) Knoll, Susan Sontag, Carin Goldberg, and two little ladies I spend a lot of time with on my days off. Kisses from Penny, my two-year old vizsla. As the Vice President of Business Development at Automattic (WordPress.com), 31 year-old Catherine Stewart’s day is a mix of goal setting, mergers and acquisitions, and developing partnerships. A Yale University English graduate with a Cambridge M.A. in Social and Development Psychology, Stewart’s interest in books has manifested into a career in forward-thinking publishing. With over 23% of all websites using WordPress, Stewarts days are long. Her first break of the day is when many of us are thinking about what to have for dinner (and she does this without the help of caffeine). How did you embark on a career in technology? It started with books. Back in 2007, I was working as a consultant for McKinsey and traveling a lot. American Airlines gave me a Sony Reader as a thank-you gift for my frequent flying, and after spending a few hours on the device, I became convinced that eBooks were the future of book publishing. I decided that if I could manage it, my next job would be in publishing, where I hoped to help pave the way for the transition to digital. I eventually joined Random House (now Penguin Random House), and three years later moved to the San Francisco Bay Area to join Facebook. Tell us about your role as Vice President of Business Development at Automattic / WordPress. I run Business Development for Automattic, the company behind WordPress.com. That involves M&A, partnerships and internal projects. I report to Matt Mullenweg, the founder and CEO. Matt has built a great team, and I’m honored to be a part of it. When it comes to M&A, Automattic raised a large round last May, so we’re in a good position to do larger strategic deals, and are actively investigating opportunities. On the partnerships side, we’re starting to work more closely with web hosting companies, and are growing our Jetpack Premium Host program. Automattic is a distributed company, which means that our employees live and work all over the world. Many of our partnerships are similarly global. Because of this, I’ve spent much of my time on the road, so a weekday at Automattic often begins in a hotel room. I’ll start the day with a cup of rooibos, ginger or chamomile tea, and due to time differences, do a call or two before breakfast. I’ll then transition to in-person meetings, tackling my inbox, and catching up on threads in Slack, the tool we use for internal messages. I’ll break around 4 or 5 pm, when I work out and call family or friends. I’ll generally get dinner with partners or colleagues, and finish the day with another round of calls or video conferences. Can you share a best (or worst) moment of your career? When I was working at Random House, the head of the Strategy and Operations team (now the company’s COO), asked me to help him devise a five-year plan for the company, including a forecast of the P&L under a variety of scenarios. To meet the annual planning deadline, we would have just three weeks to produce our first draft. As interesting and important as I knew the work would be, I at first declined. I didn’t believe that my financial knowledge or modeling skills would be up to the task, and I suggested he work with someone more qualified. Fortunately, he didn’t take no for an answer, saving me from making what would have been a poor decision. The five-year plan was hard work, with long days (and nights), but the project turned out to be one of the most educational and rewarding of my career. Not only did I get to learn about many aspects of the business, but it allowed me to work alongside and learn from the company’s executive team. The highlight was finding myself in a meeting one day, sitting at the table with our CEO and his direct reports, as we created an operating plan to convert the recommendations into reality. I love hiking and the outdoors, so many weekends I head to the Marin Headlands or Tahoe. On rainy days, I sometimes build a fire in my fireplace and curl up on the couch with a book. Any thoughts, opinions or advice for young women interested in a career in technology? Be willing to challenge yourself and make mistakes. Consider keeping a journal, where you can write down your mistakes with lessons learned and advice received. I have a journal like this, and in the beginning of my career, I read it every night (and made entries almost as frequently). I appreciate Sheryl Sandberg’s reigniting the debate around gender equality. Single malt scotch. When I was in college, I spent a summer doing research as part of a fellowship in the Orkney and Shetland Islands and I came to appreciate scotch while there. Highland Park 18 is my favorite. The world-travelled, San Jose-born Tegan Monique Gaan lives the Bi-Coastal American Dream—or “Dream-ish”—as she says. “I’m living in Skid Row, Downtown LA, and also live in Brooklyn.” She has created the buzzed-about platform, Gigit, for monetizing artists’ unused and unsold time. Talking with the 33 year-old is like driving in a racecar at full speed. Meet the unceasingly energetic and refreshingly candid Tegan Monique Gaan. Are you the Founder or CEO or both of Gigit? I find titles, well, funny. I’ve always gone with Founder. Full. Stop., or #1 at Gigit. I’m also the coffee/sandwich runner, so there’s that. Tell us about the launch of Gigit? I started building Gigit with a small team in the Ukraine with my own money in November 2012 and went out fundraising in December 2012. I found momentum after Jim Pallotta gave me 20 minutes to sit with him. I recall having to park at a 20 minute meter and 45 minutes into the meeting, I became somewhat obsessed with staring at my watch. Pallotta proceeded to ask me if I had somewhere better to be. Luckily, the meeting ended with him saying, “I’m inclined to give you 100-200K.” It’s somewhat hazy now, but I’m fairly certain I ‘Tiger (Woods)-fist-pumped’ in his face. How long from idea to existence? I’d say about 3 month tops. Significant catalysts were surrounding myself with LA’s top founders/investors via working at Amplify LA, an accelerator based in Venice Beach, coupled with constant brainstorming with super Angel Paige Craig. Did you always know you wanted to be an entrepreneur? What are your thoughts on the traditional university route for a career in technology? Hand to heart, I would recommend [the] Peter Gregory approach in not attending university. In an ideal world, I think young people should take work experience. Here’s the ugly truth: it’s all who you know in this life. My caveat is, you will have to back it up with flying colors—so I’m all for taking that nepotistic card of sorts and getting your foot through any/all doors. Just be ready to stand out and crush it with honest to goodness hard work. Honestly, being a boy/girl in this industry doesn’t affect things in my mind. What does matter is authenticity and drive. Be yourself and be ready to work f ’ing hard. There are a lot of kids out there grinding it out, some may be smarter, savvier, or have some sort of one-up on you, but your heart and dedication, or however you choose to differentiate yourself from the masses, is what matters. Gender is the least of your worries. You can quote me on that. Everyone is looking for answers to the future of the music industry. What insights can you offer in terms of monetization for artists? Gigit is not just a booking platform. I think what took me a long time to convey properly is that we are trying monetize artist’s unused and unsold time. I think that touring is such an antiquated process from start to finish and there are limitless opportunities to help artists of all levels who are on tour with things that actually matter. A free hotel room, a meal, car/tour bus repairs, taxis, a free hair cut, etc… this is why I created our newest tool called Patrons (patron.gigit.com). Will your business goals include expanding Gigit or exploring new tech ventures? If both, explain what and why. Right now, it’s all about bringing Gigit to the next level. I’m well excited about this new round of strategic investors and believe that they can help bring Gigit global. We’re so close to realizing a dream that began two years ago.